Clifton is truly my favourite beach in Cape Town. Truth be told, its fine white sand, large round boulders, lack of kelp, absence of wind, and beautiful scenery make it my favourite of all the beaches I've ever visited. Posted in General and tagged beach, clifton on Sunday, 27 May, 2012 by Paul. Also that perfect view of Table Mountian over the sea is pretty great! My favorite beach is a short bike ride from home. It is situated at a bay along the Baltic Sea. As we have long and cold winters here, people really appreciate the short summer and the beach is often quite crowded. I visit very often and will always bring a camera. Here is a link to one post about my favorite beach. 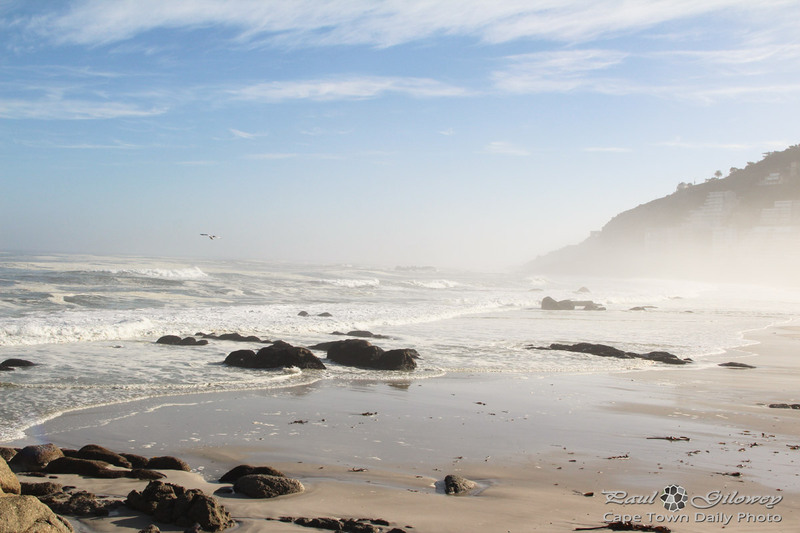 This picture evokes for me the smell of that sea wet mist and I miss my beautiful Cape Town. I follow your website so I can re-visit all the places that were home for so long. Clifton is beautiful and Blouberg too, and Kommetjie and Sandy Bay – each has its unique advantages to display. The rising/setting sun, changing skies, rolling waves drawn by the wind and long evening shadows. And that beautiful, clean white sand. I live in England and the closest was a beach in Porthcurno, Cornwall. Lovely picture Paul. Yes it is a lovely beach – I am so pleased that that Japanese trawler is not there anymore! And, was the lady in the bottom left corner really wearing a bra instead of a bikini top?! Is that normal in Sweden? (People here would consider it a little odd). @Helen, you should take @Mom to scratch through the shells. Like mother like daughter. And yes @Mom, although the trawler made a great subject for me to photograph, it wasn’t ideal to have it rusting away on the beach! @Pauline, that’s a beautiful beach, thanks for the link! Is it really as remote as the photos make it out to be? I’m guessing that the absence of people on the beach suggests it is. Hi Paul, the beach in Cornwall is more beautiful than the photos suggest. The sea is a luminescent turquoise like some grecian island in the right light. Its gets pretty busy when its hot but can be isolated at the right time of year, like a lot of the remote beaches in the UK. There are a few small beaches like that in Cornwall that have wild sea/surf and rocks. I will return to Cape Town but not sure when but I do enjoy your pics and the feelings they evoke. Your ones on Kalk Bay were visually moving, I love the colour of the boats, harbour and people. @Pauline, I noticed the water and how turquoise it was and wondered if it was in fact more so than the photos conveyed. Glad you liked the Kalk Bay ones – those fishing boats really are pretty photogenic hey! Yup, that’s so true Cristina.